Celebrate your child's next birthday at USA Professional Karate Studio with our Kickin’ Karate Birthday Party! Just Imagine: Your child and Sensei leading their friends through an authentic Karate class! 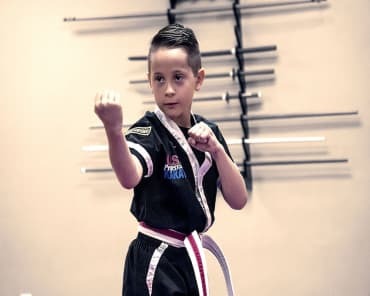 Your child will start with putting on their new official Karate Headband and then we teach your child how to welcome each and every guest with the “karate polite greeting” ..… it will be the best party of the year! Let us do all the work and give your birthday boy or girl and all of their guests the most exciting experience ever! As an added bonus: Each child who attends the birthday party receives one free week of karate classes! 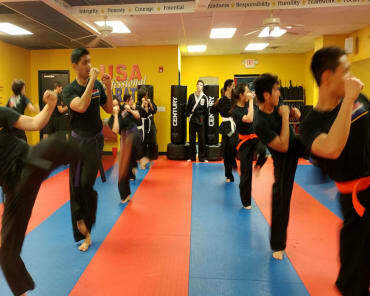 Karate "class": Begins shortly after where we start with our “warm-ups” which are karate exercises and stretches to strengthen our muscles and get our bodies ready for Karate action. Next: You will learn some Karate self-defense techniques designed especially for kids. Then: The excitement really begins as you go through our famous Ninja Trail! It's an obstacle course where you will use the skills you have just learned to fight off imaginary Ninjas. Next: Your birthday child gets to break a real board! Then: We provide Pizza, just like the Ninja Turtles love to eat! Finally: Sensei and your birthday child will cut your birthday cake with his authentic Samurai Sword! Parties can also be upgraded to include board-breaking for all the guests, and or headbands for all the guests, and or foam nunchaku including instruction for all the guests. Remember, our parties book fast. We offer them on Saturdays 3 PM to 4:30 PM. 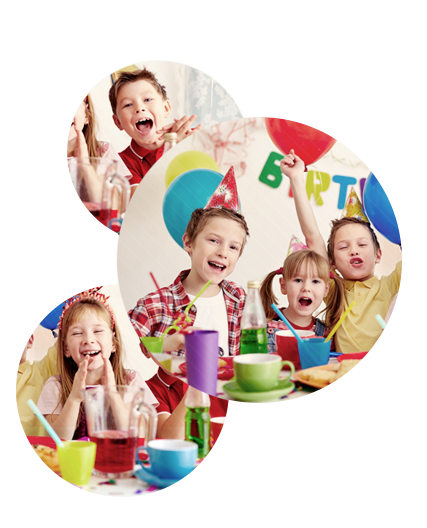 Call us today, or fill out the form on your screen now, to request the date for your child's next birthday. We can't wait to celebrate your child’s special day with you! Honestly I love these classes. I've felt more alive and empowered learning my own strengths. George is an excellent teacher, and Vicki and April are truly a blessing. I rec- ommend everyone definitely try this class!! Great program. Great class. I always learn a lot.